Settings for the module that sends email from Hexamail Guard. Hexamail Guard allows for flexible email routing through your system. Outbound emails can be sent to a smarthost or directly using 'MX lookups' to send straight to the mailservers required. If you are processing incoming and outgoing email with Hexamail Guard configure the Existing email server with the hostname/IP address and port of your existing email server. Leave the SmartHost host and port settings blank, and Hexamail Guard will use direct MX delivery (direct connections to remote email servers) to deliver emails that are not for one of your configured domains. If you are processing incoming and outgoing email with Hexamail Guard configure the Existing email server with the hostname/IP address and port of your existing email server. Configure the SmartHost host and port settings to those provided by your ISP. If you are processing incoming and outgoing email with Hexamail Guard configure the Existing email server with the hostname/IP address and port of your existing email server. Also configure your SmartHost host and port settings to be the same as those for your existing email server. If you wish to use an external smarthost to deliver email, enter your Smart Host name or IP Address and port (usually 25) into the appropriate boxes. A Smart Host is an email forwarding server, usually provided by your ISP for relay of outgoing emails from your organization. If your existing email server is setup to use a SmartHost, copy those settings into here, and adjust your existing email server settings to use Hexamail as your Smart Host for outgoing email. 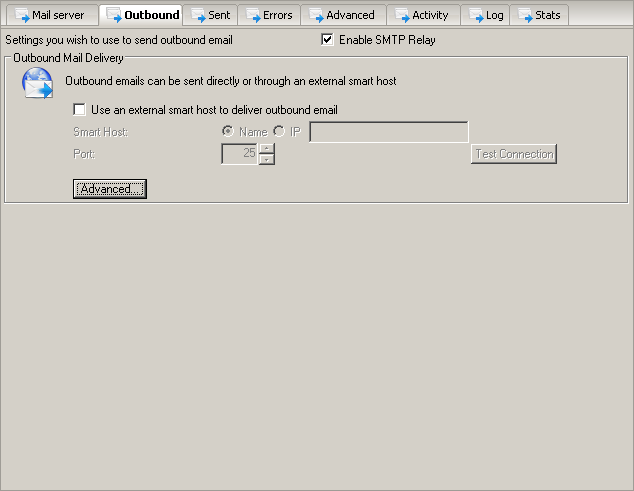 If your existing email server is not setup to use a SmartHost, leave these settings blank, but be sure to set your email server to use Hexamail as the smarthost for delivery of all emails in order that it can process outbound email. If you leave these settings blank direct MX delivery will be used to deliver emails directly to the appropriate remote email servers on the Internet. In some cases, for example if your ISP IP range is blocked by a DNS based blacklist, this may result in delivery failures. In such cases it is recommended that you use your ISPs smarthost for delivery as every measure is taken by ISPs to prevent their smarthost IP being blocked by such lists, while they are less concerned with their user IP ranges being blocked. Use SSL/TLS or STARTTLS to encrypt if when the server supports it. SSL/TLS is an encrypted connection to the server usually on port 587 or 465. STARTTLS connects unencrypted and then triggers an encrypted session using the STARTTLS command. This is usually on port 25 or 587. Use the STARTTLS setting to ensure STARTTLS is used IF the remote server advertises STARTTLS support. If set to STARTTLS Required then the email will be failed for recipient(s) on the server(s) that do not advertise/support STARTTLS in their greeting response to the SMTP EHLO command. Press the Advanced button to open the advanced options.